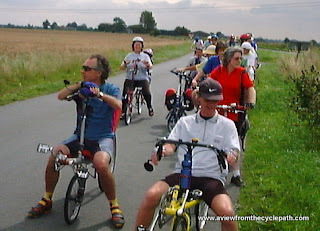 Mass cycling requires sociable side-by-side cycling which requires cyclists to take up space. Why then are cyclists the only road users expected to travel single-file? 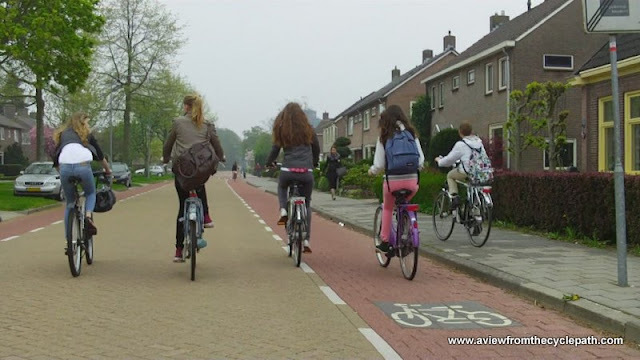 Children cycling home from school five-abreast in Assen. Riding on the pavement is not what we encourage, but this is a good illustration of how safe those children feel. Read more about this street, which is particularly well designed. 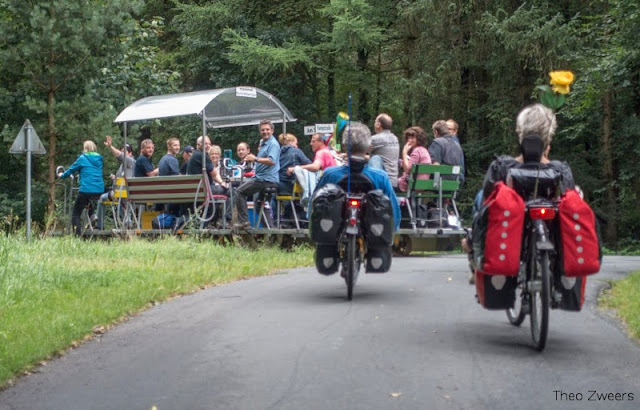 For ten years on our study tours we've suggested to participants that they should take advantage of the opportunity to cycle side-by-side while they are in the Netherlands. Not only does this keep groups together better than they ride single-file but more importantly it's far more sociable and more efficient. 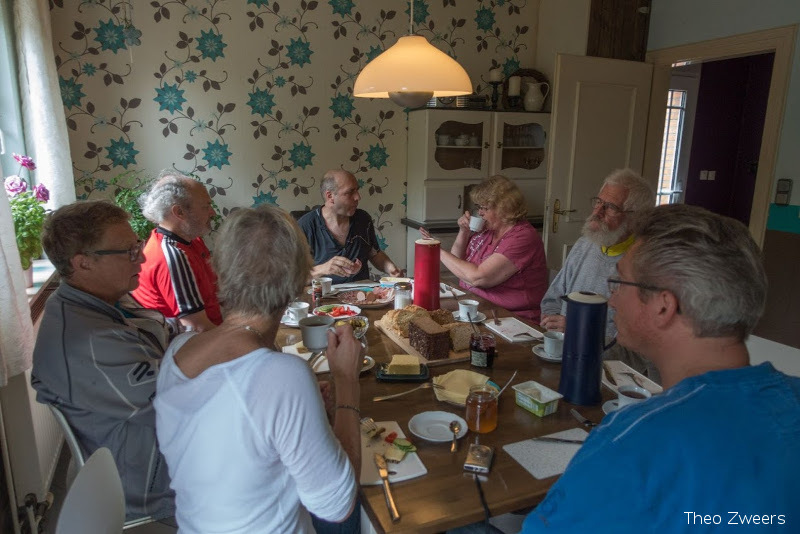 We can talk to each other as we cycle and it takes less time for the group to arrive at each destination than if we are strung out into a single line. Germany last week: He's in the bushes, we're on the grass. Sadly, German cycle-paths are often inadequate. Pedestrians expect to walk side-by-side everywhere in the world. No-one would consider advocating that pedestrians should always travel single-file. Drivers travel side-by-side even when they're alone as in a car they take an empty chair along beside themselves taking up the space that another person might otherwise use. 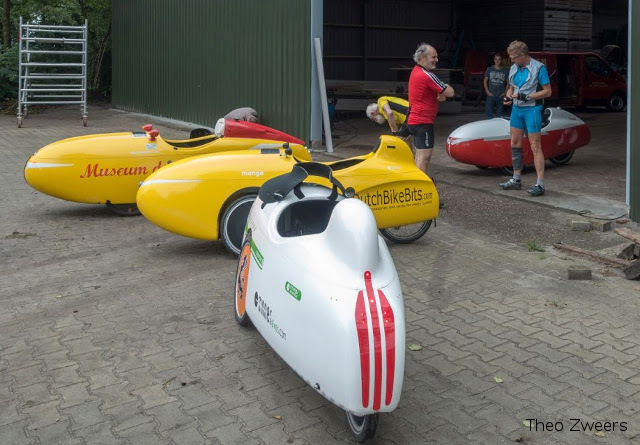 Tandem seating cars are almost unheard of (I know of this) there are no demands are made for drivers without passengers to use motorbikes instead of cars in order that they take up less space. On buses it's possible to be able to sit four abreast yet there are no calls for buses to be made narrower. It is cyclists alone who are told they must cycle single-file, or who find that where side-by-side cycling is allowed by law they are regardless put under pressure to ride single-file. As an example, the UK's highway code states "never ride more than two abreast, and ride in single file on narrow or busy roads and when riding round bends" which while it sounds quite liberal actually gives lots of scope for telling cyclists not to ride two-abreast. Many roads are narrow or busy and all roads have bends. Four members of the same family riding together in a sociable manner in Assen city centre. Dad is helping the youngest. Being able to cycle side-by-side is important because it allows cycling to be sociable. All other forms of transport are sociable and cycling should be too. People carry on conversations as they travel by car by public transport or as they walk, and it should be equally possible while cycling. What's more, side-by-side cycling is also necessary for safety. 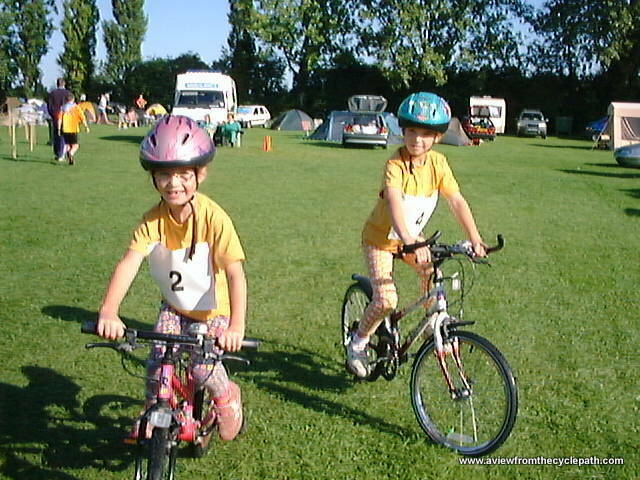 If you're accompanying a child or accompanying someone who is unfamiliar with your town, cycling side-by-side is a good way to ensure that the other person is travelling in the same direction or has seen the same signs as you have. 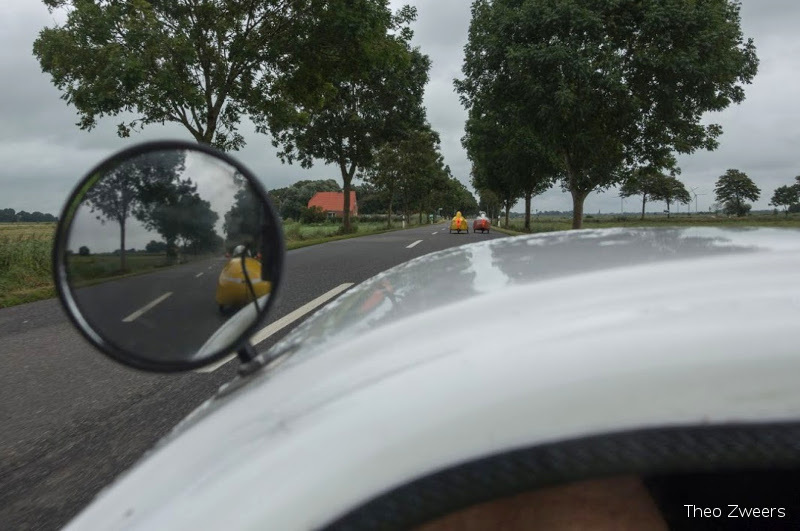 Riding two-abreast shouldn't be unusual, it should be the norm. Cyclists are people too, and just like those who choose other forms of transport we should also be able to speak to friends and family as we travel. Infrastructure which doesn't make side-by-side cycling easy to do is inadequate infrastructure. Cycle-paths need to have sufficient width to allow cycling side-by-side. 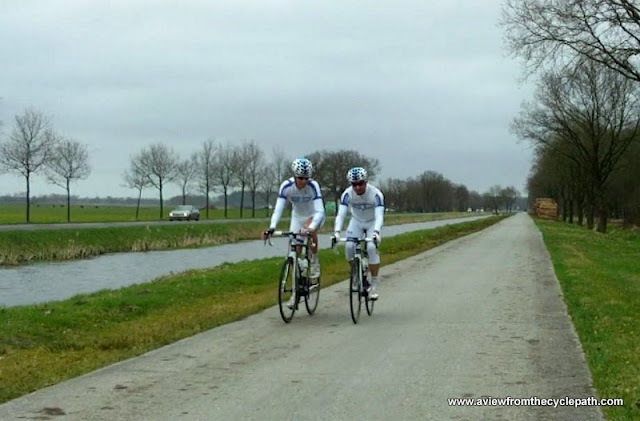 If it is necessary for cyclists to constantly adjust their position relative to each other in order to achieve part-time side-by-side cycling, this consumes a lot of extra effort. Unidirectional cycle-paths between 1.2 and 1.9 metres wide enforce single-file cycling. They also make overtaking of one cyclist by another difficult, resulting in cyclists wishing to use the road. Any width below 1.9 metres may as well be single-track as it's not really usable for side-by-side cycling. The minimum unidirectional path width for comfortable side-by-side cycling is 2 metres. The extra width of a 2.5 m wide single direction path makes the experience more relaxing and more forgiving of error. not wide enough for side-by-side cycling in all conditions. Bidirectional cycle-paths between 2.5 and 3.2 m wide enforce single-file cycling whenever there are cyclists coming in the opposite direction. 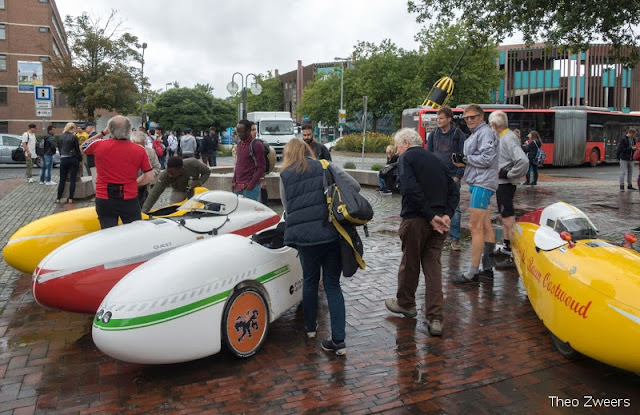 If two couples approach each other, both riding side-by-side then it's likely that both will switch to single-file, making any width between 2.5 m and 3.2 no better than the narrower width. For this reason, the required width for a bidirectional cycle-path is a minimum of about 3.3 m. On such a path it's possible for two groups of cyclists both riding two-abreast to pass each other. Extra width makes the experience more pleasant and makes passing easier. results in conflict just as it does anywhere else. Shared use paths do not work for efficient cycling because pedestrians are unpredictable and cause extra conflict. In out of town areas the number of pedestrians may be small enough that a single path suffices, but inside towns it is almost never a good idea to ask cyclists and pedestrians to "share" because they will get in the way of one-another. A separate path is required for each mode. The two paths together will still require fewer resources and take up less space than is routinely allocated for motor vehicles. properties visible in the photo. Cyclists should never be expected to ride on roads which have traffic levels so high that they cause cycling side-by-side to be a problem. In the Netherlands, through motor traffic is excluded from virtually all residential streets and city centre streets. Motor and cycling routes are unravelled from one-another and cyclists are close to 100% segregated from motor traffic. nearly four metres at a junction. By allowing two cyclists at a time to pass, and by allowing overtaking, cycle infrastructure which permits side-by-side cycling doubles the throughput of cycle-paths. If you're aim is true mass cycling in which everyone sees a bicycle as an efficient mode of transport for themselves, it's important to keep this efficiency as much as possible. That requires that cycle-paths widen at junctions and through corners. A bicycle road in Assen. Over five metres wide, and used by motor vehicles only for access. A direct route to the city centre along which sociable cycling is enabled and on which children can ride their own bikes in safety. A 2.5 m wide unidirectional cycle-path from a suburb into the city centre from a different direction. Sociable cycling is enabled here without anyone feeling too cramped. City centre street. This area allows motor vehicles access at particular times to make deliveries. Otherwise the "road" is a cycle-path through a pedestrianized area. More of the city centre. Note the disability buggy being used as a bicycle. Also note the lighter coloured stripe of ridged tiles on the left of the photo which provides guidance for blind people. Children, of course, have independence and can access the city centre area on their own bicycles. Only the youngest children are transported on their parents' bicycles. Youngsters in town on their own cycle side-by-side and talk to each other. Another example of how people with disabilities benefit from good infrastructure. This is the same junction as shown in a small photo above where a unidirectional cycle-path widens to nearly four metres to accommodate cyclists at the junction. It is possible for cyclists to make this left turn while riding side-by-side and with all conflicting motor traffic stopped. The sign on the back of the tricycle indicates that that person has hearing difficulties and perhaps requires some guidance. Riding side by side allows this. Continuing after they turn the corner. But note that the left bike is slightly over the centre line on this bidirectional cycle path, which is unfortunately only three metres wide and therefore of inadequate width for comfortable cycling in all conditions. A 2.5 metre wide unidirectional cycle-path. Riding next to a friend is no problem at all here. 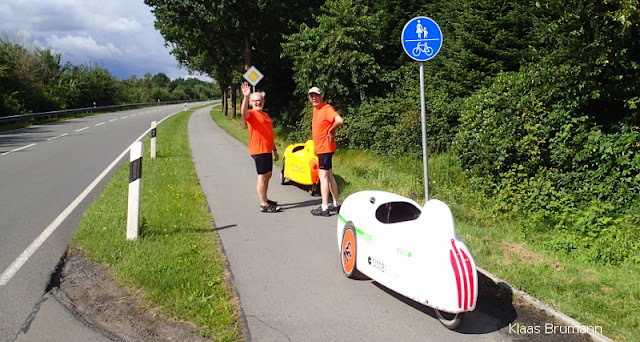 2.5 metres wide unidirectional cycle-path - a couple ride together with no difficulty. A 3.8 metre wide bidirectional cycle-path. On this width, it's possible for two couples to comfortably pass each other while remaining side-by-side. The road on the right has two lanes for motor vehicles, each of 2.8 m in width. This may look like a wide cycle-path but note that the car driver and his passenger are still allocated more space than the cyclists. In the countryside, a 3.5 metre wide cycle-path allows for cycling at a good speed without the difficulties which we had last week on much narrower cycle-paths in Germany in similar situations (see photo above). Wide bidirectional cycle-path leading to a medium sized simultaneous green traffic-light junction. 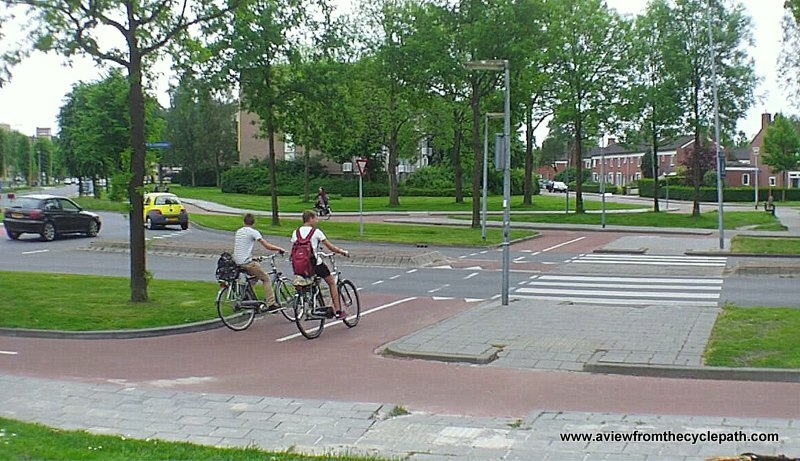 Side-by-side cycling is possible through the junction while all motor traffic is stopped. This type of junction is very efficient. Very many cyclists can cross the junction in all directions with one short green phase for cyclists. The safest design of roundabouts for cycling also easily supports side-by-side riding, which again doubles the capacity of the junction for cyclists vs. how it would be if people had to ride single-file. 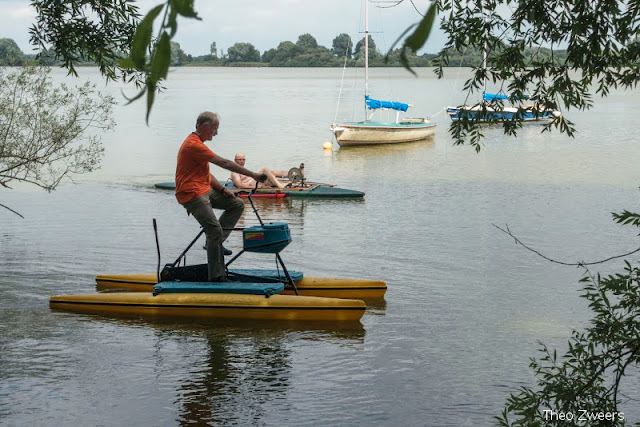 Demonstrating a four metre wide recreational cycle-path to a study tour group. No problem with side-by-side cycling here. 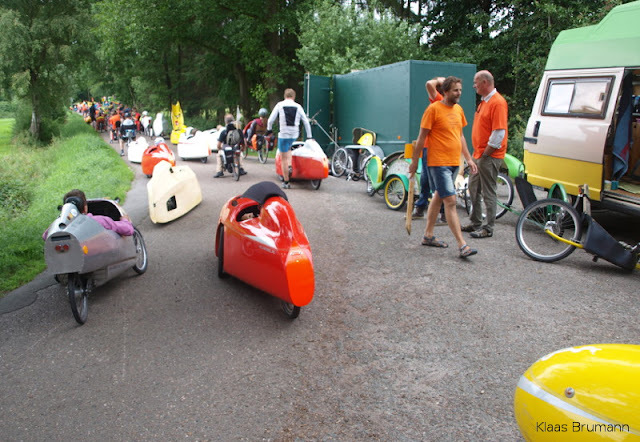 To finish, another photo of teenagers "misbehaving" by cycling five-abreast, but doing so in a manner which actually doesn't cause any problem at all. They can do this because this residential street, like almost all residential streets in Assen, is a non-through route for motorists and therefore there are almost never any motor vehicles with which to conflict. Rest assured that the boy on the pedestrian path rode back onto the road before he came close to the woman walking. He's already ahead of the other cyclists in this photo, preparing to make this move. Cyclists are the only group of road users routinely required to travel one-behind-the-other. There is no logic to this. No reason why side-by-side cycling should not always be encouraged. It's a matter of providing infrastructure which accommodates the requirement. Given that people like to pair up, regardless of which mode of transport they choose, the width required for cycling should always be considered to be the width of two people cycling side-by-side. 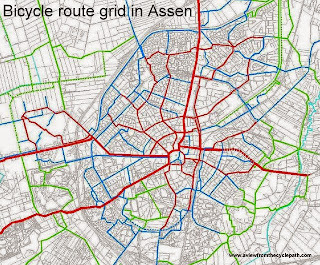 The cycle-path grid in Assen. Read more about this. By "everywhere" I really do mean everywhere. 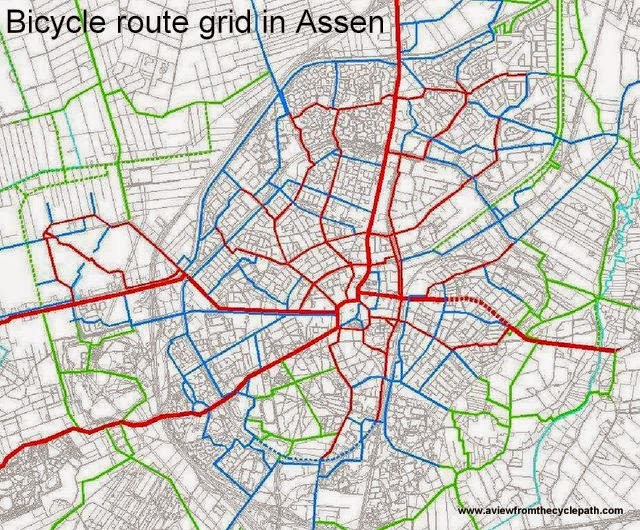 There can be no gaps in a real cycling grid. Cyclists need to be able to make their entire journeys in safety. 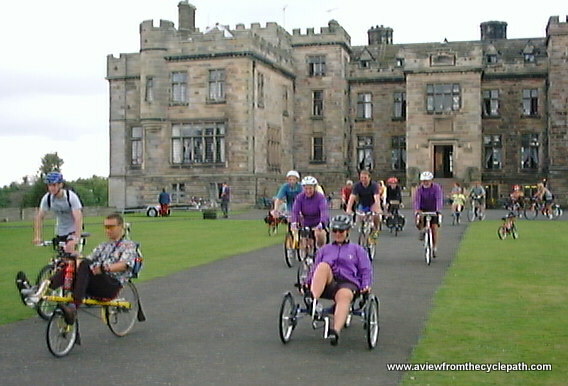 If mass cycling is truly a target then cyclists must be allowed and even encouraged to ride side-by-side. Make cycling sociable, comfortable, safe and efficient, keep people on bikes well away from motor vehicles, and suddenly cycling becomes attractive. Mark Treasure also blogged about side-by-side cycling today.